I tend to download new freemium mobile apps two to three times per month. I enjoy seeing what developers are releasing, writing my opinion about the apps and then eventually moving on to new releases. One of the apps I downloaded last week was Pretty Riddles. I’ve been focusing on puzzlers, room escape and word games for the last few months and decided to give this one a shot, based on the name. I try to take a look at the app reviews and the screenshots to see if the graphics are worth the time investment. You would be surprised at the number of apps that are available with broken user interfaces or pedestrian graphics. I guess this would be an entrant into the basic riddles category because there are no pictures. I dig that this designer has gone against the grain and focused on interesting wordplay to deliver the clue. This harkens back to crossword puzzles and other sleuth-type games that appear in the newspaper. Several different achievement badges in the game center have me engaged and ready to see how far I can go. I’m not very good at the word-only apps, but this one provides a nice challenge that stimulates my brain and keeps me learning. It’s definitely worth checking out the more advanced levels. Pretty Riddles for iOS devices at the App Store. 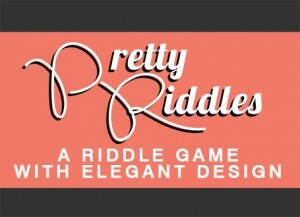 Pretty Riddles on Facebook for desktop and laptop users.